I bought a catfish yesterday labeled as an aluminum catfish. I was under the impression that the "aluminum catfish" was a single species of fish that reached an adult size of about 8 inches. I was wrong.... When I got home, I did some research, only to find that almost all of the fish in the Chrysichthys genus reached sizes of over 12" in length. Some only got to 13" or so, but others topped 2'. Is there any way that I can i.d. my cat so I know how large it will get? 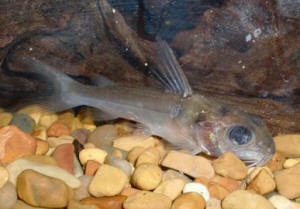 <As juveniles, many clarotid catfish look exceedingly similar, so it's impossible to say for sure. I think this is Chrysichthys longipinnis, though adults of that species have quite well developed dorsal fins. Do also look at Chrysichthys nigrodigitatus, another species that is occasionally traded. In short, review Fishbase, in particular the thumbnails of species in the family Claroteidae. If you can provide any insight, that would be great. 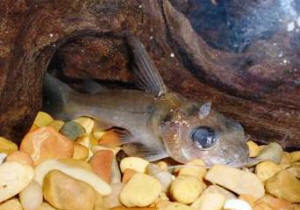 I think I have Chrysichthys auratus, but my fish is only a juvenile, about 1.5", so it's hard for me to tell. I have attached some photos of it; sorry for the poor quality and the smudges on the glass. Semester exams are coming up and I haven't had time to clean my aquarium's glass. Thanks for your reply Neale. It seems that only time will tell what species I have, but what do you think the chances are that I have a species that will reach a size of under 12"/30cm in captivity? both of these seem to match my fish, at least more closely than C. longipinnis. Or should I say, I hope that those species match my cat more closely than C. longipinnis?